My prediction that Williams would have around 250 faculty members for at least the next few years is almost sure to come true. Here is the data for the best paying liberal arts colleges. The goal of this post is not to argue that Williams professors are paid too much or too little. (In my view, they are paid just right, at least those with salaries below $150,000. Williams administrators are paid too much.) Instead, I just want to explain the details since it seems like many readers have no clue as to empirical reality. Now that we know the salary data for 2008-2009, I can answer Derek’s question from last October. Dave, for once, for the love of all things holy, could you not demagogue the issue? What percentage of Williams profs make more than $100,000? Since the average salary of Williams professors in 2008-2009 is $109,800, the answer is about 50%. I am please to be of help. it still seems like everyone was right (humanities profs probably aren’t making 100k on average, science profs are, etc.) and it still seems like further proof that the biggest arguments happen over the smallest things. It is actually pretty amazing that a full professor at Williams, who in almost every case will have been near the top of his or her class in college, done well at an elite grad school (while subsisting on Ramen noodles for six years), then amassed a top-notch publication and teaching record for a decade or two, earns far less than the typical first year associate at a large law firm. I realize that an academic job is a heck of a lot more satisfying, and I am not judging salaries right or wrong in any absolute moral sense. But I just want to remind folks that, in all the fever over budget cutting, in the grand scheme of things, these are very, very smart people, who have worked very, very hard to get to the top of their fields, without nearly the financial compensation that their intellectual talents could attract in virtually any other endeavor. They deserve kudos and respect for that. Rory: I have never heard anyone claim that humanities profs are systematically paid less than non-humanities profs at Williams. Indeed, the opposite claim has been made in the Record, that with few exceptions (economics and computer science being almost the only ones cited), Williams pay is highly similar across departments. In other words, the average physics professor is paid about the same as the average English professor, adjusted for years at Williams. I could be wrong about that, but if you have a citation, I would be interested to read it. Jeff: Correct me if I am wrong, but there are many aspects to life as a “first year associate at a large law firm” that are not, uhhh, very fun. How many hours does such a lawyer spend in the office? (Schapiro Hall is a ghost town before 9 and after 5.) How many three day week-ends to first year associates take? And so on. I have no problems with the Williams pay scale, but the notion that Williams professors work harder then other professionals is suspect. (But perhaps I am misinterpreting your “very, very hard” claim incorrectly.) Doctors work hard. Lawyers work hard. Consultants work hard. Even people in finance work hard. And professors work hard. So what? The notion that professors could have (easily) chosen to be elite lawyers/doctors/consultants is as suspect as the reverse claim, that elite lawyers/doctors/consultants could have easily been Williams professors. Some could have. Some couldn’t have. In either case, the issue of the appropriate salary for Williams professors has nothing to do with what lawyers make, just like the appropriate amount of vacation time for lawyers has nothing to do with how much vacation Williams professors take. you may be right about williams, but in most academic markets, the sciences make more money. Unless math has changed since I last looked at it, the average tells you absolutely NOTHING about how many faculty are on either side of that line. We don’t have a mean, we have an average. A handful of outliers or even a concentration around a number like $160,000 could push the average up while still leaving a majority of faculty under $100,000, especially given that we know the Associate & Assistant numbers are below $100,000. And obviously the number could be artificially lower due to a concentration on the low end. You might be right that half of profs are over $100,000, and such a conjecture doesn’t seem out of line – but the average above neither supports nor disproves that statement. Your 50% is a guess, and Derek’s question still stands. David, I DID say in my comment that being a professor is more satisfying (and I include better quality of life in that). I know plenty of attorneys making half a million who would trade places with a college professor making much less than that (plenty, of course, would laugh at that idea). In theory, you are correct. But, in this case, we know that there are not any huge outliers or bizarre clustering. So, the mean and median salaries are almost certainly quite close together. If anything, 50% is probably an underestimate. First, we have data on the top end from Form 990. Faculty salaries top out at around $200,000 and those few seem to be very special cases. There are no outliers, so mean and median won’t be that different. Second, we have lots of testimony in the Record and elsewhere, that Williams does not have a star system, that faculty generally got the same percentage raise each year, and that merit raises are not a major part of the equation. With an N of 256, a max of around $200,000, a min of around $60,000, and general smoothness (which we can also see in the clumpings for assistant and associate professors), it is almost certain that at least 128 Williams professors have a salary of more than $100,000. UPDATE: Actually, it is “total compensation” that tops out around $200,000 for Williams professors. Salary only goes as a high as $170,000 or so — although that data is several years old. Schapiro Hall might be empty, but only because the profs can do most of their work from home after hours. I’ve seen a lot of math/science profs wandering around the science center at 11pm, midnight, even 1am. Sometimes they’re there to help students, but quite often they’re finishing work of their own. Being a prof is definitely not a 9-5 job. I second 10, but am still a bit agog at the size of those numbers. 1) I did not mean to claim that being a prof is a “9-5 job.” Indeed, during the summer, Schapiro Hall will be a ghost town from 9 to 5! ;-) Also, my own ECON 18 students can confirm that I was looking at their drafts and e-mailing them at all hours of the day and night. The contrast I was trying to draw was with Jeff’s example of first year lawyers, who are virtually chained to their desks for 80+ hours a week. Even though they could, in theory, do much of their work elsewhere, they are forced to be in the office. One big difference between Williams profs and first year lawyers is not so much how many hours they work (although your average Williams prof does not work as hard as a first year lawyer) but the freedom that the Williams professor has to conduct her work where and when she pleases. That is one of the great gifts of the academic life. I am here all week . . .
David, I thoughy you were brought up better than to misrepresent the statements of others! 1. getting a named chair (note: if named chairs were separated out from full professors, there might be evidence that the average is below 100k. but i don’t really care about that whole she-bang). 2. a professor’s current school matching (or getting close to matching) an offer from another school trying to poach a professor. So while there may not be “merit raises” in the traditional sense and while assistant professors might not get much benefit from the above two mechanisms, there are ways in which professors salaries differentiate themselves even while @ the same school. Unless Williams has made a public statement that it does not match/respond to outside offers, that’s the way “merit” gets calculated into salaries from what i’ve seen. I work with one professor who leaves between 3 and 4 every day to pick up her kids. She emails me at 2 am and loses sleep over the weekends to finish drafts and sometimes gets into the office (and she’s technically on leave, btw) around 7 am. I work with another professor who works until 7 or 8 every night, but does not take work home. The beauty of academia as a place to work is that one works however one chooses. The struggle of academia is there’s ALWAYS something else we want to/should do on top of what we get done. we cross-posted, but i’d add that the comparison between first-year lawyer and average professor isn’t fair. First year to first year (or even dissertating student) would be better. your posts always sound as though you think professors have it easy. Do you? If not, why am I getting that image? Actually David, in FACT I am correct. You said that knowing the average for 2008-09 now answers how many profs make above or below $100,000. The average tells us no such thing. Read your quote. You now, in your responding comment, have asserted another bit of info (a smooth curve) which I also don’t think we have data to support. I question your underlying assumption. First off, how is learning the average from 2008-09 a missing data point that suddenly made it clear how many profs make over $100,000? The data last year was pretty darn similar (and you had that in your last 27 posts on the same issue). Re: the smooth curve…Your link doesn’t work, but I’ll give you that there might not be any outliers; I don’t see how you can claim there aren’t clusters around certain salaries. Even absent merit raises and a general practice of hiring stars, salaries can end up clustering (again, I have no idea if they did here but it’s certainly possible). Depending on when profs got hired, what experience they brought with them, and how hard they negotiated, starting salaries vary at least somewhat even within the junior level. You then end up with new people starting at the same salary as some other professors who perhaps came in a few years before but moved up with annual increases. The lack of merit increases means annual increases are relatively small, so I think it might be easier for a cluster to form, particularly if there were 1-2 years where the school happened to do quite a bit of hiring. This isn’t some nefarious idea, it’s math. I know you can’t really be claiming the system is so rigid that a 5% variation couldn’t happen to woo a potential hire (a 5% difference that would then make the starting salary virtually identical to someone hired the year before at a slightly lower salary)? Fact is, you’re making a conjecture based on a (relatively small) bit of data. I frankly don’t care that much about the real number, but I do care about stating things as fact that aren’t fact (or “almost certain”). This chart is interesting, and although I’m not obsessed with nickle and diming the budget, this is good general data that I’m happy you posted. I just don’t think you actually have the data to answer Derek’s question (ah, where are you dcat – come back!). Oh – and since I was re-reading the post to see if you actually pointed to other data (you didn’t) who exactly is so clueless about empirical reality in your previous posts linked above? I’m confused as to who you’re insulting – one link was to a post with Morty’s initial email, is Morty the one allegedly clueless about what Williams pays its professors? I don’t get why you linked to those other posts. Please explain. 1) This is a better link. Thanks for pointing that out. This first post there provides a link to the FY 2005 Form 990 (pdf), listing the five highest paid professors. As you can see, there are no outliers. (Note that this combines salary and other benefits together under total compensation. We are talking about just salary. So, as a rough estimate, the max salary for Williams professors was around $175,000 4 years ago. 2) The data was similar last year, so this is a minor point. But Derek’s claim last October was, presumably, for current salary (meaning 2008-2009), so only now do we have that precise data. So, I am making a claim that the median salary is at least $100,000. You are claiming that this might not be true because the median might be significant lower than the mean of $109,800. Given what we know above, this is almost impossible. Let me give you two proofs. First, come up with a plausible distribution that has the characteristics that we know are true (in terms of mean, max, smoothness and so on) but which has a lower median than $100,000. You can’t. QED. Second, let me try my very best to come up with such a distribution and show that any such distribution is obviously ridiculous in what it implies about the distribution. 1) Assume that all 72 assistant profs are paid $75,800 and all 42 associate profs are paid $92,100. (For this exercise, the spread does not matter since all we are trying to do is maximize the number of faculty below the $100,000 cut off.) That gives us 114 faculty with total salary of $9,325,800. For my claim about “at least 50%” to be wrong, we need another 15 faculty to make less than $100,000. 2) The total salary pool for all faculty is just 256 times $109,800 = $28,108,800. 4) The way to minimize the median salary (or at least maximize the number of faculty with salary below $100,000) is to assume as many senior faculty as possible with a $99,000 salary and the rest as highly paid superstars. For example, in theory, Williams might have 141 full professors at $99,000 and one professor at $4,824,000. This would yield the reported average. 5) But we know that Williams has no outliers. So, a less extreme version would allocate 15 full professors to making $99,000. This would leave $17,298,000 left to allocate among the 127 remaining full professors or $136,200 per professor. To be honest, I am surprised that the answer is not more clear cut than that. But, obviously, this scenario is completely implausible because we know that the College does not group a bunch of salaries at the $99,000 cut-off and that salaries (especially among senior faculty) are stretched out over a continuum. For every faculty member who makes $105,000 or $110,000 or $115,000 (and there are many of these), you need to bump up someone else at the other end to make the math work out. There is just know way that a well-behaved distribution can accomplish this. This is “almost certain.” Do you really think that Williams has a whole clump of junior faculty at exactly $99,000? Given the way that faculty are hired and steady year-by-year percentage raises are given, there is no way (without big outliers) to have a mean that is that different from the median. If you know the mean in such a situation, you know the median. you just proposed an actually very clear out–that senior faculty (that is full professors) are not smooth. You don’t have any evidence that they are smooth except for conjecture (reasonable or not). if, for example, the 50 (let’s pick a random number) named full professor chairs get a significant salary bump (say, up to 150k at minimum), then it becomes more reasonable to believe that the first two or three years in which one is a full professor, one makes less than 100k. I’m not saying its likely, but it is possible. And the data you’ve shown does not in any way indicate that it isn’t plausible. You assume smoothness within categories but have no evidence of smoothness except at the tails of the distribution. That’s not necessarily a safe assumption. also–where are visiting professors in this whole exercise? also, the data shows an unequal raise across categories (possibly due to promotions, etc. and not unequal raises) of 2% for associates, 5% for full professors, and 3.7% for assistants. not sure how that plays in/matters. also–you show your quality breeding again with your jab at derek in post 14. tsk tsk. 2) You may get that image because I spend so much time correcting mis-impressions to those who see each Williams faculty member as a unique, irreplaceable snowflake. So, when Derek makes a claim about how few Williams faculty make more than $100,000, it falls to me to correct him. When someone claims that the College “needs” to spend hundreds of thousands of dollars on the local school system, it is my job to point out that that isn’t really true. I also spend plenty of time writing about how wonderful the Williams faculty is, but few seem to comment on that aspect of my prose. You may get that image because I spend so much time correcting mis-impressions to those who see each Williams faculty member as a unique, irreplaceable snowflake. Not only do you come across as condescending there, but it just seems like another shot at the faculty. Why do you feel so compelled to write such things (especially when that’s clearly a caricature of people’s arguments re: donating to the schools and salary discussions). 1) I believe that this entire analysis only includes tenure and tenure-track faculty. 2) Perhaps we don’t disagree, depending on our definition of “possible.” There is an empirical reality. Of the 256 Williams faculty in this analysis, X make more than $100,000 in salary. I think that X is at least 128. You think that it is “possible” that X is less than 128. I agree. It is “possible.” But I think that there is a less than 2% chance of that. 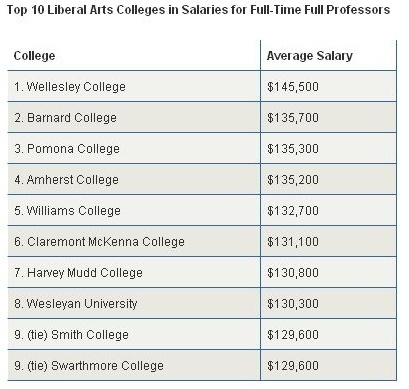 In other words, I am 98% certain that at least 128 Williams faculty have a salary of at least $100,000 in 2008-2009. See here for the plot. As the plot makes clear, this is an example with a big dip in the middle. If you really believe that faculty compensation is significantly bi-modal, then you can tell this sort of story (and then slide down the valley to be just below $100,000 rather than above it). To make this at all plausible, you need a story with a bunch of associate profs around $90,000 who then split into two groups. The stars who get named chairs and then go up to $130,000+ and the non-stars who get such small raises that, even as they stay at Williams for years and years, never break $100,000. I have never heard anyone describe the Williams faculty salary structure as working this way, and I have talked to more than one professor who has claimed just the opposite. Please close your links so the rest of us can comment please. smh…the plot you created looks nothing like the plausible scenario I proposed. In short, it’s bimodal, but non-normal. It looks perhaps normal until there’s a large second mode around 150k for the named chair group (which would be a subgroup of the full professor group that williams reports in that table). the only point of my thought experiment (now performed in two different manners–one with my second mode @ 150k and no normal assumption, once with your bi-modal normal distribution), is that there are reasonable ways to describe a faculty salary distribution that have means and medians that are significantly different from each other with the limited information ephblog’s been able to gather. Here is the faculty handbook on salary. Here, here and here are three Record articles. There is no evidence that named chairs or anything else might play a significant role in any clumping of faculty salaries. Instead, the typical pattern is yearly growth. At Williams, the faculty currently sees increases of $2000 to $2500 a year for one additional year of experience, plus inflation. There is no way that such a steady process plus relatively equal starting points and no high outliers can lead to a situation in which the median is significantly different from the mean. Dammit, if only I had saved my morning post until after this discussion, I could have added “Employing R to ascertain likely median salary of Williams’ faculty members, and subsequent methodological debate.” That would have undoubtedly won in a landslide. [Professor Marc] Lynch also pointed to the College’s dedication to maintaining a rough salary equity as a possible disincentive for professors to stick around. The school’s pay structure lacks the hierarchical structure of that of the larger universities, who use money to attract the best talent. While Lynch says that in his case, money was not the issue at stake, he admits that it might play a role with other professors. “If a faculty member is weighing an outside offer from a very different kind of institution, such as a major research university or one based in a major urban area, there’s only so much that Williams can do. That’s the sad truth,” Lynch said. So, Rory’s theoretically plausible example of named chairs getting the big bucks and thereby creating a non-smooth distribution is false, assuming you believe Marc Lynch. Lynch’s quote and your other links do not prove that named chairs do not include a salary bump. salary equity across cohorts doesn’t mean that there isn’t a substantial bump once your cohort enters named chair territory. i don’t really care about this issue, but the door isn’t closed as shut as you seem to believe (lynch is an associate professor at GW, fwiw). which seems to repeatedly be the case, until you come with new information which you either had earlier (and thus you were baiting people, which is obnoxious) or you didn’t (in which case, our critiques were valid and your assumed fact was, in fact, not yet proven fact). And I haven’t proved that the the moon isn’t made of Swiss cheese, but I recommend you look elsewhere when making your daily sandwich. Williams has “rough salary equity” with “increases of $2000 to $2500 a year for one additional year of experience, plus inflation.” There is no way that these statements can be true (and the AAUP and Form 990 data be correct) without a median salary that is very close to the mean salary. It is very easy to be right when you move the goalposts. You did not say that “at least 50%” of profs made over $100,000. You said that just about 50% did. So, I am making a claim that the median salary is at least $100,000. You are claiming that this might not be true because the median might be significant lower than the mean of $109,800. …obviously the number could be artificially lower due to a concentration on the low end. I claimed that the median might be other than $100,000, not that it is likely lower. I was not arguing for it being one way or the other – you wanted me to make that argument or assumed I was making it, I’m not really sure. Perhaps that is what Derek argued? I don’t know. In fact, my primary criticism was that you stated something as fact that we don’t have data for – that about 50% of profs make over $100,000. Could be 65-70% quite easily, or there is a narrow chance it could be 45%. I don’t feel like dealing with the calculations right now, but I will say that the From 990 shows three profs who are the very defintion of outliers, since their compensation (which I think is exclusive of health/401(k) if I read it right) is roughly $30,000 more than the other two top earners. The three profs are not outlierly enough to matter to any of these calculations. interesting, JG gets the benefit of the doubt but I don’t! anyway, again your smoking gun IS NO SUCH THING (though it likely is, in terms of proving something, it does nothing). “Rough pay equity” with standardized increases is clearly only true within categories (that is, assistant profs are roughly equal to their cohort of assistant profs, etc.). My theoretically plausible argument still stands that there is a fourth uncaptured category within the “full professor” category that may skew the median. Note, also, that such a category would not mean that there is pay inequity, just that the table made publicly available is not perfect data. Now, like with JG’s point, that may skew it right or left, but that potential source of skew is not disproven because an associate professor noted that there is “rough pay equity”. Basically, you’re the one who spoke of “facts” when they weren’t. Don’t get so mad just because we’ve pointed that out. An engineer, a physicist, and a mathematician are looking out the window of the Scottish countryside, and see what appears to be a black cow. The engineer says: Cows in Scotland are black. The physicist says: Some cows in Scotland are black. The mathematician says: There is a cow in Scotland, one side of which is black. The philosopher says: Cows, irrespective of their apparent colors, and Scotland are illusions. Cows? In Scotland? Nah, let’s make them sheep instead. And Dave would attach wheels to everything in the landscape and position vast numbers of buckets of paint so that he could instantly change every marker he had purported to set in the argument. speaking of sheep that aren’t sheep, I just read Murikama’s A Wild Sheep Chase. Bizarre and fascinating book. I haven’t read that one, but I did get to The Wind-Up Bird Chronicle a couple of years ago. It was one of those books that was an exasperating read, but unforgettable after the fact. Murikami is one of the most original writers around. Hard to describe the way his work leaves it’s mark on one’s psyche. I can only handle him in doses. I was chastised for being anti-social this weekend because I was trying to figure out Murikami’s novel. I’m hooked…and it was a fellow eph who introduced me to him!